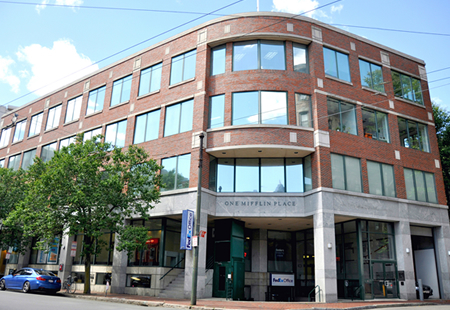 Located at 119 Mount Auburn Street in Cambridge, One Mifflin Place is a 4-story, 27,000 square foot Class A office and retail building in the heart of Harvard Square. The building features expansive window lines, bright spaces, and a glass facade that wraps around the building’s street-level frontage. Centrally located in Harvard Square, One Mifflin Place is convenient to the neighborhood’s world-class attractions including Harvard University, MIT, and the Charles Hotel. The building is surrounded by the Harvard Square’s numerous lifestyle amenities such as public transportation, the Charles River, and some of Cambridge’s best restaurants, shops, and hotels. One Mifflin Place features prominent tenants including FedEx Kinkos, Bank of America, GGA Software, Prezza Technologies, and Regus.